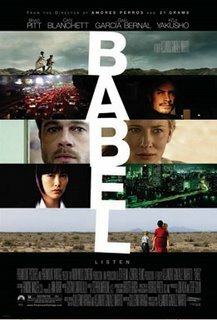 "Babel" is far less about cultural and linguistic misunderstandings than it is a story about how people react to stressful events when placed in unfamiliar surroundings. Like "Traffic", "Crash" and "21 Grams" before it (the latter from "Babel"'s director), this film ties in four stories, each from far different backgrounds but all linked to the accidental shooting of an American tourist in Morocco, which either sets into effect, or in the case of the character from Tokyo, coincides, with much confusion and pain. This is not an easy film to sit through as it demands your attention for the full 2 1/2 hours. Nor is it obvious - at times, the viewer may find him or herself perplexed as to where it's going. If you're looking for something with a neat and tidy, straightforward, linear narrative, this isn't for you, but on the other hand, it's a very cinematic (in the truest sense of the word) tale which, in the end, demonstrates that human beings do share commonality by examining the reaction of each of the characters to their own challenges, which are difficult, tragic, and at their core, utterly real.